Maria Paladino-Fitz, president of Media Consultants, LLC, has been in the advertising and marketing field for over 20 years, during which time she has built a solid reputation as a trend -setter, offering innovative marketing products and new media solutions to her clients. Under her leadership, Media Consultants has built a dedicated creative team of marketing experts and has developed strategic alliances with contracted service providers to offer marketing and advertising services tailored specifically to the medical and healthcare community. Paladino-Fitz said, “We welcome Jolie Ruffalo to our team. She comes to us with over 25 years in the healthcare marketing field and she will be an asset to the company and to the medical clients we serve”. Media Consultants is a full-service media marketing and planning firm. Its team creates print advertising campaigns, marketing collateral, broadcast and digital campaigns for television, radio and internet platforms, and expert social media marketing for a vast array of clients. The firm provides a comprehensive range of traditional and digital integrated marketing and advertising services designed for medical and non-medical healthcare and wellness companies. Among its current healthcare client roster are physicians, chiropractors, physical therapy centers, dental practices, senior housing facilities and a healthcare education company. In addition to advertising and promotion services, Media Consultants offers website design and development, public relations, reputation monitoring and repair, organic search engine marketing (SEO); video production, and copywriting, branding and graphic design services. The firm handles all forms of broadcast media planning and media buying for outdoor, transit, magazine ads and television commercials. Paladino-Fitz is an avid user and promoter of new technology and uses innovative media products in her customized packages, from walk-on virtual spokespersons on websites to branded YouTube channels. Paladino-Fitz said that she has big plans for her medical marketing division as the go-to, full-service marketing agency for medical and ancillary healthcare providers as well as non-medical service and wellness companies. “We can handle the marketing and promotion for facilities and service providers in the long-term care and elder care spheres as well as those who offer support services for the elderly or patients during post-surgical or rehabilitation periods. These include nursing homes, adult day care centers, assisted living facilities, and home care agencies,” she said. Dr. James Lesinski is an experienced dentist in Amherst, NY, who offers cutting-edge dental procedures including dental implants to his patients. He is proud to announce that he and his Complete Health Dentistry team will be participating in a 10K event on Saturday, April 11, 2015. The event is designed to promote awareness for combatting hunger in local communities. Dr. Lesinski is proud to contribute his time to raising awareness to combatting hunger, during the Run 10 Feed 10 event in April. The 10K event is designed to support the Feed Foundation and minimize hunger in local neighborhoods. Money raised during registration and through fundraising efforts is donated to local communities, in an effort to feed hungry families and individuals. In addition to combatting local hunger, Dr. Lesinski and his team also serve the community by providing top-quality dental services and procedures. Patients who are missing teeth can receive top-quality titanium dental implants from his practice. Implants are an ideal alternative to dentures because they are anchored directly into the jawbone. This ensures that they will not need to be secured in place with paste, and they will not make embarrassing clicking sounds or fall out during a meal. Patients who receive implants typically report that they feel and look like natural teeth. Additionally, implants are designed with very durable materials that make them a permanent solution for lost teeth, with proper care. Patients with crooked teeth or other cosmetic issues can also receive cutting-edge, corrective treatment options from Dr. Lesinski’s practice. Many patients like to have the option of receiving traditional, affordable braces. However, patients who are embarrassed about the conspicuousness of traditional braces can opt to receive invisible corrective devices such as Invisalign® from Dr. Lesinski. Dr. Lesinski encourages patients who are looking for a dentist in Amherst, NY, to visit his practice website at http://www.completehealthdentistryofwny.com to find out more about dental implants and the other services he provides. Complete Health Dentistry is a general practice offering personalized dental care for patients in Amherst, NY. Dr. James Lesinski is committed to providing patients with the latest in dental care and technology, and believes that the patient is in control. Dr. Lesinski prides himself on listening to patient concerns, educating each patient on treatment options available to them, and providing trustworthy services. In addition, Dr. Lesinski has received numerous awards and has been recognized as a Top Dentist chosen by his peers and a featured dentist in “Who’s Who” in cosmetic surgery. He is also a member of the New York Dental Society, American Dental Association and Erie County Dental Society. To learn more about Complete Health Dentistry and the services they provide, please visit their website at http://www.completehealthdentistryofwny.com, or call (716) 691-4470. ScienceBased Health, a leading provider of premium nutraceuticals for eye health, today announced the appointment of Ike K. Ahmed, MD, FRCSC and Lisa C. Olmos, MD, MBA to its Scientific Advisory Board. 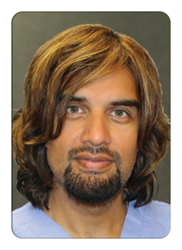 Ike K. Ahmed, MD, FRCSC is Assistant Professor, Department of Ophthalmology at the University of Toronto, where he directs research at the Kensington Eye Institute and the Glaucoma and Advanced Anterior Surgical Fellowship program. He has authored a myriad of peer-reviewed journal articles and book chapters, and serves on the editorial boards of publications, such as Ophthalmology, Canadian Journal of Ophthalmology and formerly the Journal of Cataract and Refractive Surgery. Dr. Ahmed is the recipient of numerous awards, most recently the 2014 Binkhorst Medal from the American Society of Cataract and Refractive Surgeons. In 2010, Dr. Ahmed was selected as one of Canada’s “Top 40 Under 40”. Dr. Ahmed received his doctorate of medicine from the University of Toronto, where he did his medical and surgical internship and ophthalmology residency. He completed a fellowship in glaucoma and anterior segment at the Moran Eye Center, University of Utah, and was later appointed Clinical Assistant Professor. Lisa C. Olmos de Koo, MD, MBA is an Assistant Professor of Ophthalmology in the division of vitreoretinal surgery at the University of Southern California’s Keck School of Medicine in Los Angeles, where she is the director of the surgical retina fellowship program at the USC Eye Institute. Dr. Olmos is the Primary Investigator of the Argus trial at USC and is currently leading USC in the commercial launch of the Argus II Retinal Implant for patients with retinitis pigmentosa and related retinal degenerations. She also has research experience in macular degeneration and diabetic retinopathy. Dr. Olmos received a bachelor’s degree in chemistry from Harvard University, an MBA from Rice University, and a medical degree from Baylor College of Medicine, where she was the recipient of the American Medical Women’s Association scholastic achievement award. Dr. Olmos completed a medical internship at Georgetown University/Inova Fairfax Hospital, and completed her residency and vitreoretinal fellowship at the world-renowned Bascom Palmer Eye Institute at the University of Miami. In her final year in Miami, she served as Chief Resident, Clinical Instructor, and Co-Director of Ocular Trauma. Dr. Olmos has been voted one of Pasadena’s “Top Doctors” for 3 consecutive years from 2012-2014, and she was the recipient of a “Rising Star” award from Los Angeles Magazine in 2013. Drs. Ahmed and Olmos de Koo join SBH’s Scientific Advisory Board members: Paul S. Bernstein, MD, PhD, Associate Professor of Ophthalmology and Visual Sciences, Retina Division, Moran Eye Center, University of Utah School of Medicine; Jeffrey B. Blumberg PhD, FACN, FASN, CNS, Professor, Friedman School of Nutrition Science and Policy and Director, Antioxidants Research Laboratory, Jean Mayer USDA Human Nutrition Research Center on Aging, Tufts University; Alon Harris, MD, PhD, FARVO, Alon Harris, PhD, Professor of Ophthalmology and Cellular & Integrative Physiology, Indiana University School of Medicine; Douglas S, Koch, MD, Professor and The Allen, Mosbacher, and Law Chair in Ophthalmology, Cullen Eye Institute, Baylor College of Medicine; Paul S. Koch, MD, Medical Director, Koch Eye Associates; Stephen C. Pflugfelder, MD, Director, Ocular Surface Center, Cullen Eye Institute, Baylor College of Medicine; and John D. Sheppard, MD, MMSc, Ophthalmology Program Director, Eastern Virginia Medical School, Clinical Director of the Thomas R. Lee Center for Ocular Pharmacology and President, Virginia Eye Consultants. ScienceBased Health®, a privately held company founded in 1997, develops and markets evidence-based nutraceuticals for eye health. The Company’s formulations include: HydroEye®, a clinically tested, patented oral formulation for dry eyes; OcularProtect®, a comprehensive multinutrient for eyes and overall body health; MacularProtect Complete® AREDS2, a powerful formulation to preserve macular and whole body health, based on AREDS, AREDS2 and other advanced research; OmegaAdvance®, a premium quality omega 3 supplement; Optic Nerve Formula®, a powerful formulation to protect optic nerve health; DiaVis®, a specialized formulation to support retinal circulation; and other high quality products. The formulations are based on the latest science, made from premium ingredients and manufactured according to highest quality standards in NSF® certified facilities. For more information, contact ScienceBased Health at: (888) 433-4726 or visit: http://www.SBH.com. Global public health organization NSF International has launched the NSF Cosmetics and Personal Care Program in response to growing concerns from consumers and retailers regarding adulteration, mislabeling and counterfeiting issues. The new program provides auditing, training, product testing, claim substantiation and certification services developed by NSF to enable manufacturers to improve the quality and safety of their products and retailers to strengthen the oversight of their cosmetic and personal care suppliers. Good Manufacturing Practice (GMP) Auditing: This program meets the growing demand for third-party verified compliance to cosmetic manufacturing GMP quality standard ISO 22716, which is recognized worldwide and mandated by European regulations. It also encompasses U.S. Food and Drug Administration (FDA) guidance criteria for cosmetic production, laboratory controls and customer complaint handling, which is essential for cosmetics imported into the United States. Manufacturers earn a graded audit that retailers use to qualify and set standards for their suppliers, and that serves as a baseline for continual improvement. Bundled Audits for Food, Personal Care and Dietary Supplements: Many facilities produce ingredients for multiple product categories spanning food, cosmetics and dietary supplements, each of which has its own set of specific quality and safety guidelines. NSF perform audits to multiple schemes and labeling requirements including dietary supplement GMPs, food safety schemes benchmarked under the Global Food Safety Initiative, ISO 9001 and ISO 14001 in addition to cosmetic GMPs. This eliminates audit redundancy and disruption to production operations while reducing costs. Testing: This includes testing to verify label claims including “free from” substances like Bisphenol A (BPA), PABA (p-Aminobenzoic acid), sulfates, parabens and many others. NSF also screens cosmetics for contaminants to verify their safety and quality. This is in addition to substantiating compliance to regulations in Europe and the U.S. (e.g. Proposition 65). Label reviews and physical, chemical and performance characteristic comparisons against national brands are also available for retailers that have concerns regarding their private label cosmetics and personal care product lines. Product Certification: NSF certifies cosmetics to widely accepted programs, including the EPA’s Design for the Environment (DfE) program, which verifies that cosmetic products and ingredients do not contain chemicals of concern such as known carcinogens or reproductive and developmental toxicants. NSF International also certifies cosmetics to either the USDA National Organic Program (NOP) or the American National Standard for personal care products containing organic ingredients (NSF/ANSI 305) via NSF’s sister company QAI. These programs are important to safety-minded consumers in particular as a recent independent study conducted on behalf of NSF found that 44 percent of consumers prefer products that are independently tested and certified. Training and Consulting: NSF provides GMP training for professionals who are involved in manufacturing and distributing cosmetic and personal care products so they can stay apprised of the changing regulatory landscape and best practices in supply chain quality. Those professionals who know how to conduct gap analyses and identify regulatory noncompliances before they become an issue will add value to the manufacturing process, and also help minimize safety and quality risks. NSF can also provide expert consulting to evaluate a cosmetic manufacturing quality and safety system, help facilities resolve complex quality problems or guide companies through the proper procedures for responding to FDA warning letters. To learn more about the NSF Cosmetics and Personal Care Program, please contact Casey Coy at cosmetics(at)nsf(dot)org or +1 734-904-2995. Media Contact: To schedule an interview with an NSF cosmetic or personal care expert, contact Kelly Ingerly at media(at)nsf(dot)org or +1 734-827-6850. NSF International’s Cosmetics and Personal Care Program provides auditing, ingredient and product testing and certification, and training and education for the cosmetic and personal care industries throughout the entire product lifecycle. NSF International developed the only accredited American National Standard for personal care products containing organic ingredients (NSF/ANSI 305) and provides verification of cosmetic and personal care ingredients to the Environmental Protection Agency’s Design for the Environment (DfE) program. Beauty products and cosmetics have become overgrown with labels covered with flowers and greenery and words like natural and healthy. The September 2014 issue of ShopSmart, from Consumer Reports, features an in-depth look at hidden health risks that can be found in cosmetics and other beauty products, ingredients to avoid, and more. As a result of consumer demand, some manufacturers have been phasing out certain problematic chemicals, but there are still dangers consumers should be aware of. The following information from ShopSmart identifies ingredients to avoid and meaningful labels and apps that help users make better choices when shopping for beauty products. Formaldehyde releasers and 1,4 dioxane, both possible carcinogens, may be found in some anti-wrinkle creams, mascaras, makeup removers, hair conditioners and body washes. They can contain preservatives that release formaldehyde over time when mixed with water. Avoid products with quaternium-15 and DMDM hydantoin listed as ingredients. Phthalates. Diethyl phthalate (DEP), which is found in fragrance, and dibutyl phthalate (DBP), a plasticizer in nail polish, have both been deemed toxic by the Federal Hazardous Substances Act. Steer clear of products with ingredients lists that include the word “fragrance,” and look for nail polishes that do not have DBP or DMP in the ingredients lists. Triclosan and Triclocarban. Found in hand and body washes, deodorants, toothpastes, and some cosmetics, these antibacterial agents can affect reproductive growth and developmental systems. Choose products that do not list triclosan or triclocarban on their ingredients list. USDA Organic. Requires that at least 95 percent of the ingredients be organically grown and prohibits the use of all potentially harmful synthetic ingredients. Natural Products Association Certified (NPA) and Design for the Environment (DfE). Standards include bans on triclosan, phthalates, formaldehyde, and formaldehyde releasers. Non-GMO Project Verified. The product contains no genetically engineered ingredients. The full report, which includes more ingredients to avoid, specific product recommendations, and other meaningful labels and seals, is featured in the September 2014 issue of ShopSmart on newsstands now. Launched in Fall 2006 by Consumer Reports, ShopSmart draws upon the publication’s celebrated tradition of accepting no advertisements and providing unbiased product reviews. ShopSmart features product reviews, shopping tips on how to get the most out of products and “best of the best” lists. It’s ideal for busy shoppers who place a premium on time. 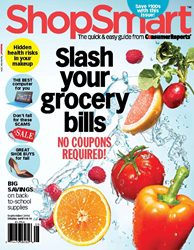 ShopSmart has a newsstand price of $ 4.99 and is available nationwide at major retailers including Barnes & Noble, Walmart, Kroger, Safeway and Publix. ShopSmart is available by subscription at http://www.ShopSmartmag.org.